As Kyle Rudolph sat down to a stack of letters, written to him from patients he had helped through his work at the U of M Masonic Children’s Hospital, he saw the name at the top of the stack and knew he wouldn’t be able to keep his composure for long. It was from the Delgado family, whose relationship with Rudolph dates back to a friendship he formed with their adopted son Anton during his visits to the hospital. Anton, who suffered from a rare genetic disorder called epidermolysis bullosa that prevented the top layer of his skin from being firmly attached to his body, died in Dec. 2015 from complications while being treated for the condition. Rudolph’s final visit with the Delgados came hours after the Vikings’ Thursday night loss in Arizona, and Anton was buried in Rudolph’s jersey. Rudolph got through three-quarters of the letter, he said, before his emotions took over. The Vikings’ long-standing relationship with the Masonic Children’s Hospital appealed to Rudolph, whose younger brother Casey battled neuroblastoma as a kid. The deep relationships he’s formed with parents there might have taken him by surprise. 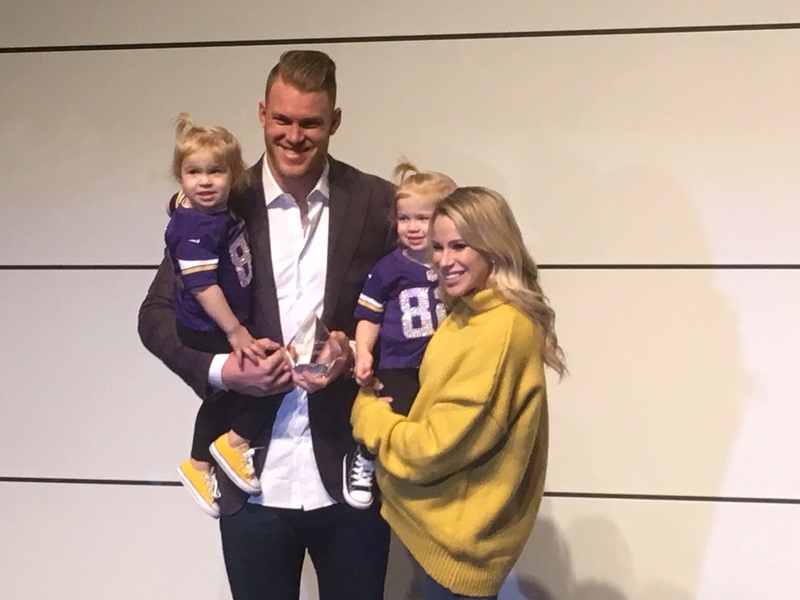 The 29-year-old Rudolph was recognized on Wednesday for his work at the U of M Masonic Children’s Hospital, where Rudolph and his wife Jordan opened Kyle Rudolph’s End Zone — a 2,500-square-foot space where patients can relax, play with siblings and friends and spend time in healing therapies. Jordan Rudolph said Wednesday the space has seen more than 4,000 patient visits since it opened in March.